GPS Co-ordinates: N51 10' 60" W000 83' 50"
You can find this gravel- and sediment-bottomed ford over the River Wey at the very western end of the metalled Tulls Lane, in the village of Standford. 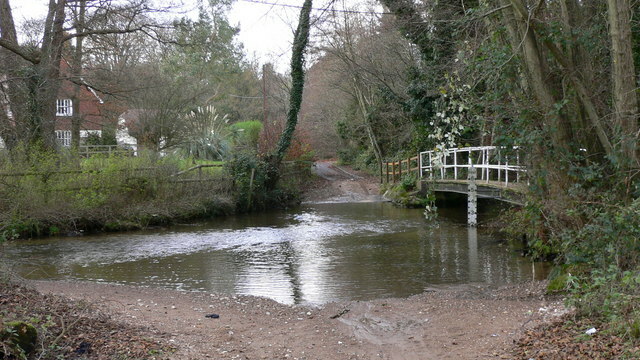 An iron footbridge with associated depth marker runs along the northern side of the ford. It can get pretty deep in flood, and has an average depth of 2 feet in summer. Don't even try to drive it when it's in flood. Literally just up the road you can find the even better Lindon Ford. Why not combine the two with one visit? This ford is also featured in Land Rover Owner International magazine's November 2012 issue as byway number 9. 22/12/2013 was an example of when to walk away. The gauge was showing 3 foot and there was a strong side current. A local lady also confirmed that what looked deep, was (she normally rode it on her horse)! A very wise move. Even three feet of water, moving with sufficient speed as during a flood, is a force to be reckoned with and could easily cause disaster. Always avoid a ford unless one is 100% confident on safe passage through it.